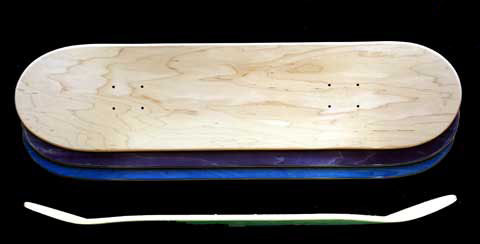 The traditional longboard is the most common type of longboard. 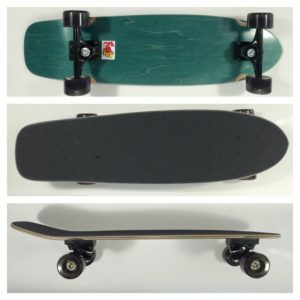 There are probably the ,ost variety of Longboards in this category. Longboards are mainly for carving or cruising around the streets. They arent usually for downhill or freeride although they can be. Those boards ( listed below) tend to be a bit more specialized. 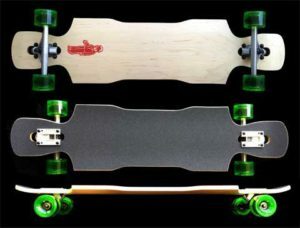 The most common and well known of the traditional longboards is the pintail longboards followed by, kicktail long boards, and Swallow Tail and many other abstract shapes. The pintail is shaped like a tear drop with the wide nose to the skinny pointed tail. The kicktail can also have many shapes. Named the kicktail because the tail kicks up in the back making it easier for turning the board. 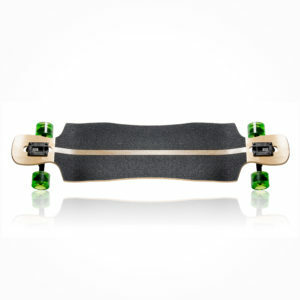 Due to the need for more speed and definitely more control the drop through longboard was born. The drop through gets its name because the trucks actually drop through the truck holes of the board. This type of board is for more advanced Downhill and Free ride longboarding like speed racing, carving and sliding. Because of how the trucks drop through the board it brings the deck lower to the ground for more control and less chance of speed wobbles. A speed wobble is when the board goes back and forth uncontrollably causing the rider to get thrown off. Although it is most popular with down hill riding or free ride a lot of skaters would rather cruise around on a drop through than a cruiser because of the lower center of gravity and dropped height make it easier to ride. The drops down longboards are very similar to drop through longboards in many ways. Drop Downs and even double drops (drop down drop through) like the Funbox LTD are even lower. The difference is that the drop down sits even lower to the ground for more speed control. These decks tend to be a bit stiffer and heavier. The main purpose for the drop downs are for downhill sliding although it’s getting more popular for your everyday cruiser. Another great feature about the drop down that we discovered is that the drop down is easier on your knees. With the popularity in commuting and distance racing these double drop longboards have become very popular and more commonly seen. The board sits extremely low to the ground causing less tension on them when pushing.